By 1982, although King had become a tremendously successful horror novelist, he wanted to prove he had the ability to write something a little.. different. 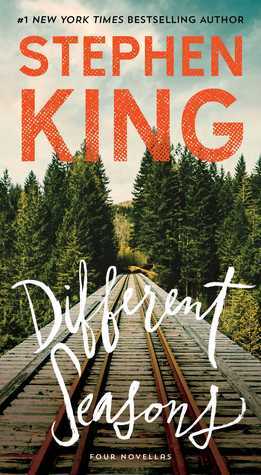 Therefore, with four previously unpublished novellas just lying around, King crammed them into one singular release he dubbed Different Seasons. Rita Hayworth & The Shawshank Redemption – I’m sure I’m not going to ruffle any feathers by saying that Frank Darabont’s film adaptation is one of the greatest of all time. Having seen it and loved it, I’ve always been curious to read the source material. Without a doubt, Darabont did King’s work justice and the bits he added to the movie expand upon the original rather than muddle up the story. Also, it’s likely impossible not to hear Morgan Freeman’s voice in your head – even if “Red” is supposed to be an Irishman. This was the only story I felt was too short, but I can always watch the movie if I ever need more of Andy and Red. Apt Pupil – This was my favorite of the bunch, despite the subject matter. Todd Bowden discovers a former Nazi, Kurt Dussander, is living in his neighborhood and promptly threatens to expose him unless he recounts his time as the head of a concentration camp – in painstaking detail. Apt Pupil is some of King’s strongest character work through Todd’s gradual mental breakdown. In the film version, a different ending is used that I feel takes away from what the novel built toward. The original ending is chilling stuff. The Body – Like Shawshank, The Body is one where I had seen the movie (Stand By Me) beforehand. I haven’t seen the movie in years and only really remembered two parts: the leeches scene and in the end when they find the deceased kid, Ray Brower. I can remember watching this when I was very young and having to turn away from the screen when they find the body. I was terrified! I guess things are scarier when you’re eight. I didn’t like this one as much as I expected. King injected a few short stories by a character within the story that I found unnecessary and really broke up the flow of the novella. The Breathing Method – Of the four novellas contained in Different Seasons – this is the closest to King’s horror wheelhouse. The Breathing Method is the odd one out that has yet to be adapted for film and is probably my least liked story of the bunch despite earning bonus points for taking place around Christmas. As someone who occasionally struggles with story collections, the fact that the book was limited to four novellas helped me to invest in the characters and each story before moving onto the next one. Although jumping from Apt Pupil to The Body was a little difficult if only due to the fact that the ending to Apt Pupil blew me away.